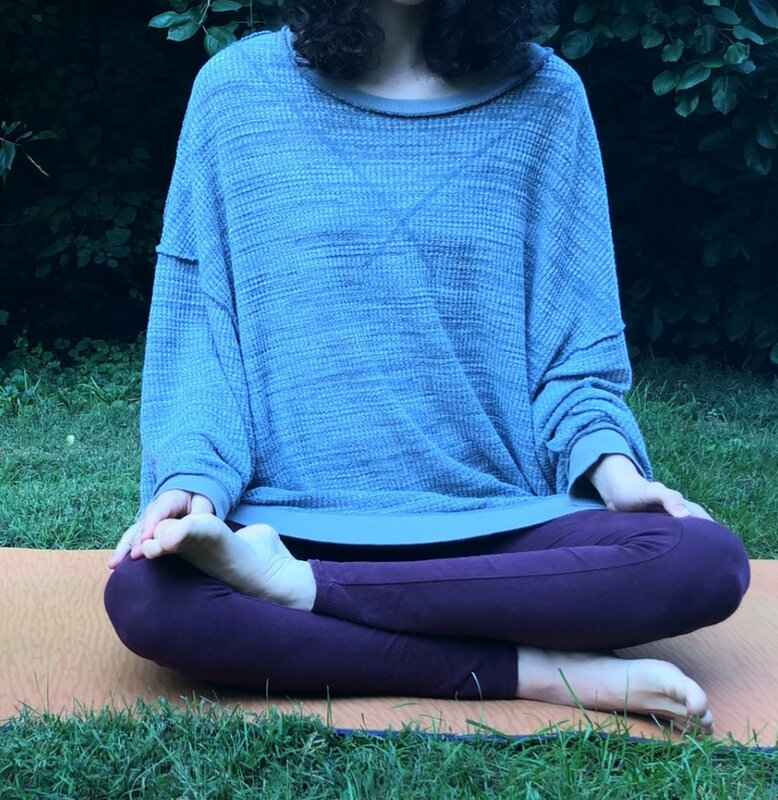 This pose is called “easy,” but for many of us, sitting up straight can actually be really challenging! It requires a good deal of core strength, so as we’re building up to this, it can be helpful to have some alternative variations. 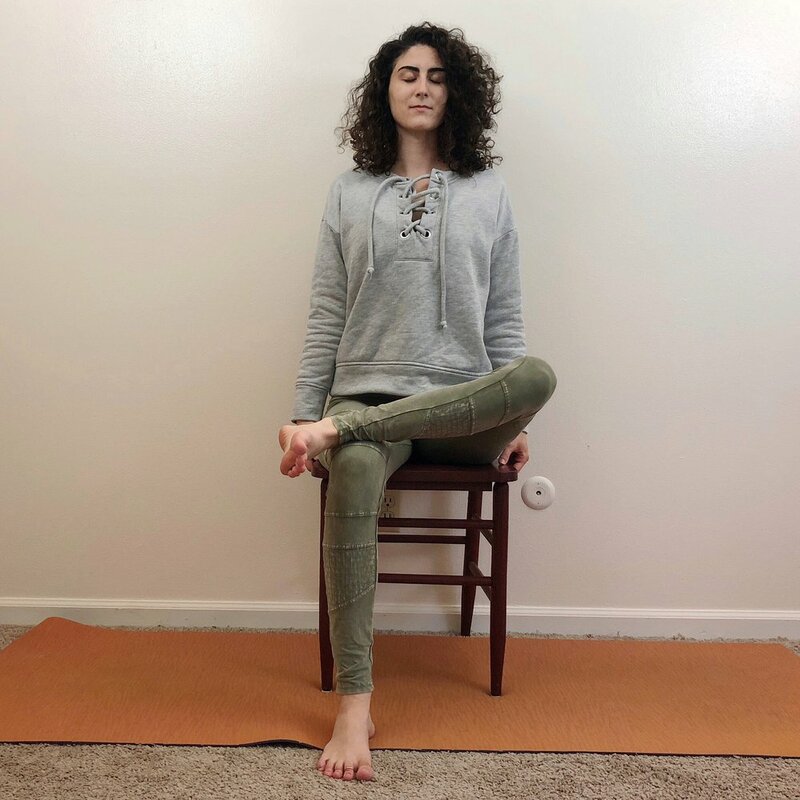 Finding a comfortable seat is so important in yoga, especially when you want to be able to sit for awhile to meditate. Come down onto the floor and be seated. Cross the ankles in front of you. Root the sit bones evenly into the floor. Feel the tailbone lengthen toward the earth as the navel pulls in and up. This will keep the pelvis neutral and protect the low back. Knit the front ribs in. Relax the shoulders and get broad through the collar bones. 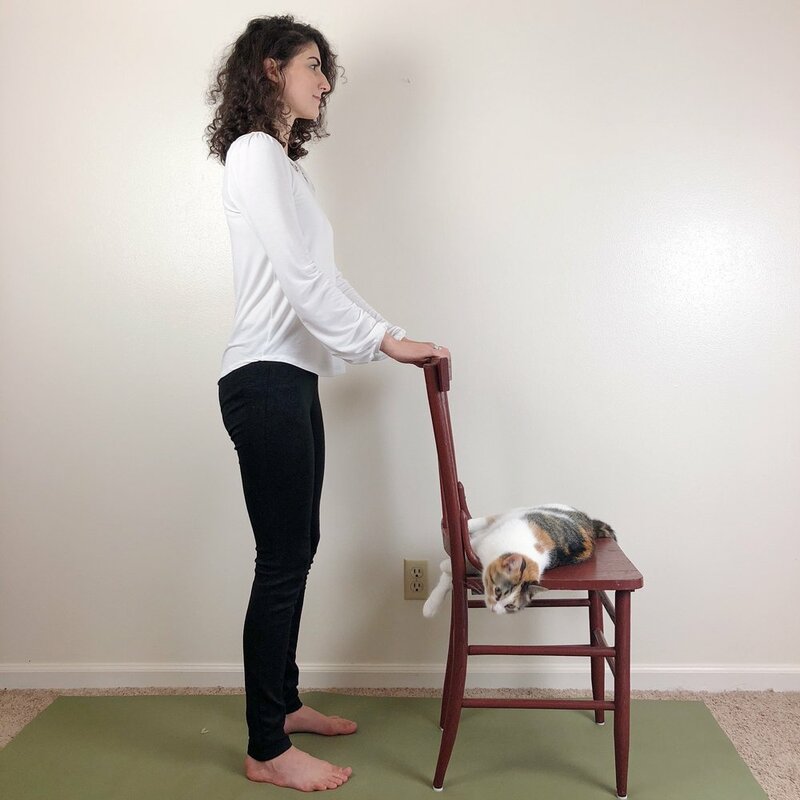 Rest your hands on your thighs - I find that this helps the shoulders relax better than putting the hands on the knees, but you can choose what you prefer. Gently tuck the chin to create length in the back of the neck as you reach through the crown of the head. The eyes may softly close. Stay here as long as is comfortable for you. Sitting up straight can make us feel like we’re drifting back in space because most of us spend so much time hunched over. 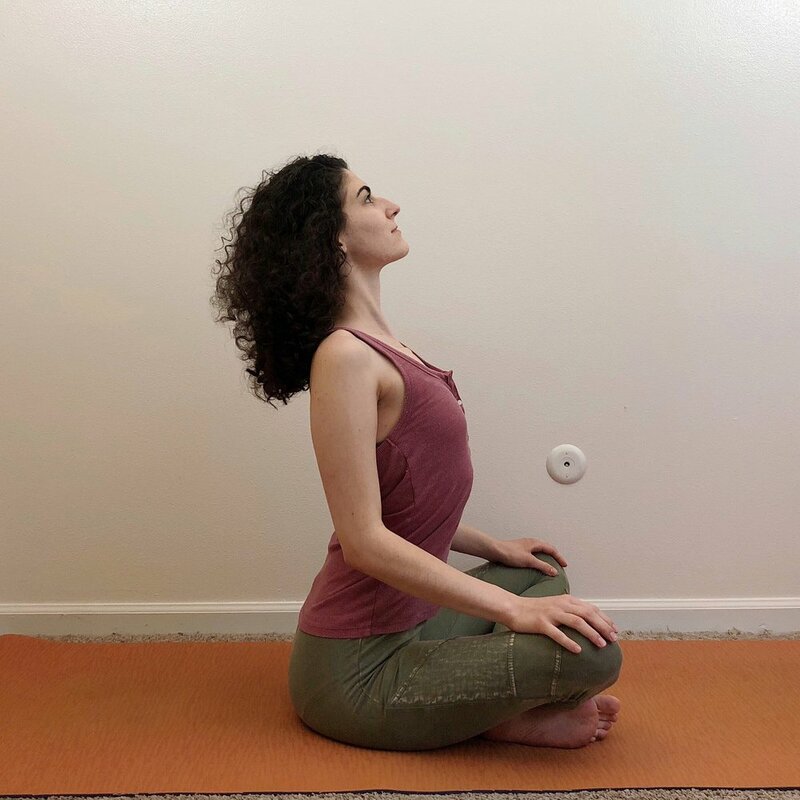 If you’re not sure if you’re sitting up straight, try practicing this pose at a wall (see photo/description below). If your toes or legs easily fall asleep in this pose, try propping the pose with a cushion or bolster (see photos below). Sitting with your back against a wall will help to retrain your muscle memory to remember what it feels like to sit up straight. If you struggle with poor posture or if you have weak core muscles, I’d recommend this variation. Sit with your sacrum and shoulder blades pressing into the wall. Sit up tall, lengthen the tailbone away from the crown of the head. Knit the front ribs together. Your natural lumbar curve will create a small gap between your low back and the wall. This is good. Lean back and let your head rest against the wall. 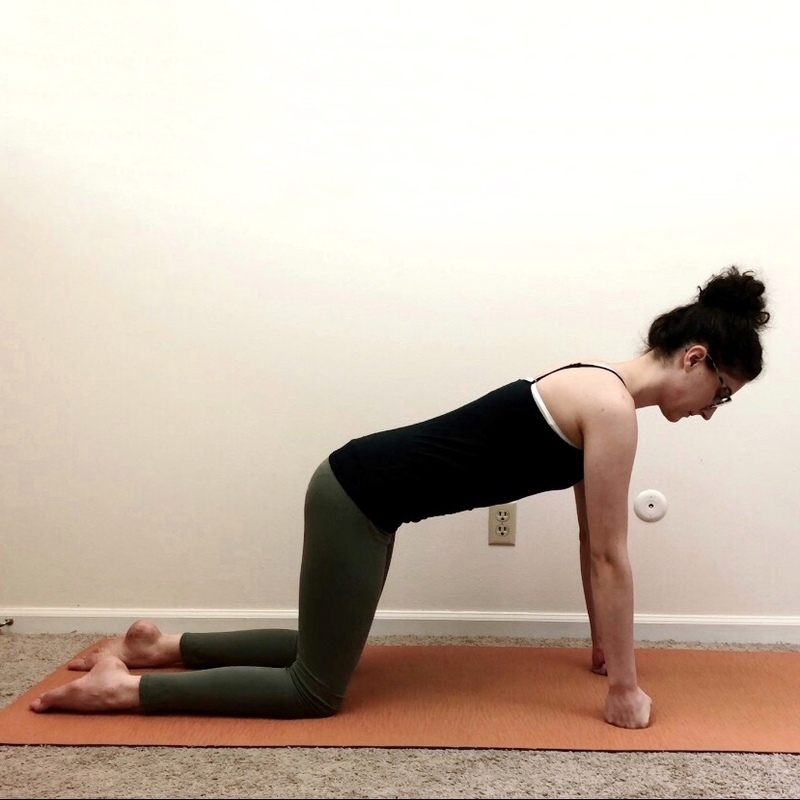 If you experience low back pain, hip pain or knee pain in this pose, elevating your hips with a prop may help this pose feel more comfortable. You can try using a folded blanket, bolster, cushion or yoga block. Find the height that feels right for you. Make sure to sit at the edge of the prop so only your seat is on the prop. Doing so allows the pelvis to come into neutral and creates more space for the hips to open. 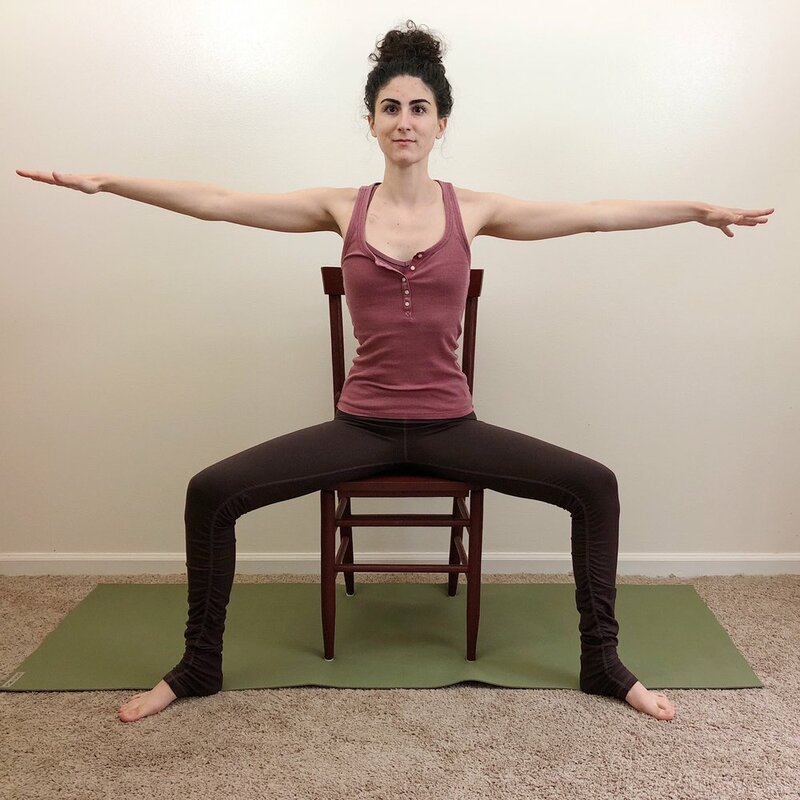 To practice this variation, be seated at the edge of your chair with the feet flat on the floor and the knees over the ankles. Separate the knees so that they’re in line with the hips and the femur bones are parallel. Sit up tall and evenly press both sitting bones into the seat of the chair. Lengthen the tailbone away from the crown of the head, gently pulling the navel in toward the spine. Relax the shoulders. Dip the chin to create length in the back of the neck. Rest the palms of the hands on the thighs. If crossing the ankles doesn’t feel comfortable, try siddhasana. 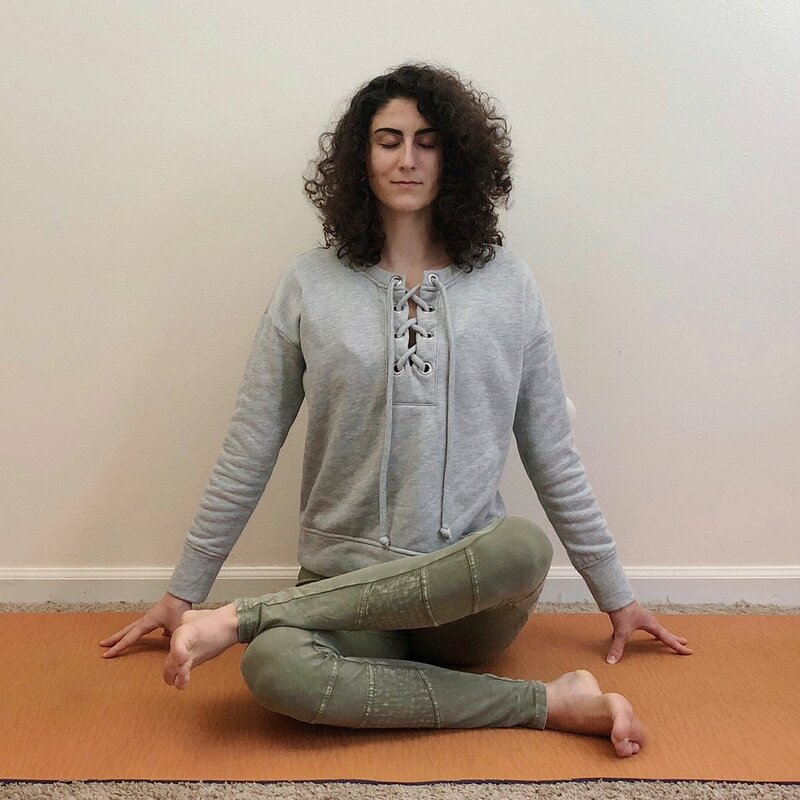 This pose is a lot like sukhasana, but iInstead of crossing the ankles, you’ll line the heels up in front of each other so that the tops of the feet are on the mat and the heels point up toward your face. Depending on your knees, this may or may not feel good. If your knees are sensitive, try sitting up on a folded blanket or cushion. Sukhasana is the go-to yoga pose for seated meditation, but you can meditate in savasana, too! It might be a bit harder to stay awake, but if it’s more comfortable for you to lie down, then I say to go for it. Firelog pose is also known as double pigeon pose (dwi pada rajakapotasana) or ankle-to-knee pose. It’s a deep hip opening pose, and it requires a focused awareness of the knees for safe practice. Start by being seated on the floor. Stack the shin bones with the left on top of right, aligning the left ankle over the right knee. The left foot will “hang” off of the knee. Flex the left foot as though you’re trying to press all four corners of the foot into an invisible wall. The right foot can be flexed or pointed - experiment with each and see which feels best for your body. You will probably notice a generous space between the top knee and the bottom ankle. This is okay. Sit up tall. Lengthen the spine. Knit the front ribs together. Relax the shoulders. Take the fingertips to the mat on either side of the hips. Relax the jaw. Relax the muscles of the face. If it feels comfortable for you, you may close your eyes here. Hold for ten deep breaths, then practice on the other side. You may be tempted to bring the top foot over the bottom knee in order to close the gap between your top and bottom leg (see image above). DO NOT do this. This will result in foot sickling, which can cause problems in the ankle and torquing in the knee. This can result in damage to the knee joint over time with repeat practice. The hips can happily rotate externally, but the knee cannot. Flexing the foot will keep the external rotation happening in the hip only. Think ankle over knee. Not foot over knee. Keep the top foot flexed to protect your knee. Knit the front ribs in, and sit up tall. Most of us will have a pretty large gap between the top and bottom leg. You may also notice a gap between the bottom knee and the mat. Adding folded blankets or yoga blocks can help you relax into the pose with more ease. But this isn’t a free pass to let go of muscle engagement! Keep the top foot flexed. Keep your spine tall. Firelog pose is INTENSE. If you find that the stretch is so intense that you are struggling to take deep breaths, consider practicing sukhasana instead. Sukhasana will open the hips in a similar fashion. Hold for teen deep breaths or longer if desired. For this seated variation, you'll sit at the edge of your chair with the feet flat on the floor. Lift the left foot and place the outer edge of the foot on a block or you can cross the left ankle over the right knee. It’s still just as important to keep your top foot flexed here! Hold for ten deep breaths, then practice on the opposite side. For this option, you'll lie down on your back with your knees bent. Cross one ankle over your opposite knee. Keep the foot flexed to protect the knee. You may already be feeling a stretch. If so, stay right here. If you want to go deeper, you can interlace your hands behind your bottom knee and bring it in toward your chest. Make sure that the shoulders stay relaxed against the mat. Tadasana is frequently inserted throughout vinyasa (flow) yoga classes. This pose brings us into anatomical neutral and serves as a reference point for the rest of our movement during the practice. It may look easy, but holding this pose can be really challenging! Stand with the feet hip distance apart and toes pointing straight ahead. Press into all four corners of the feet, feeling yourself rooting into the ground at these points as you simultaneously lift up through the arch of the foot. Keep a soft bend in the knees. Pull the lower belly and front ribs in. The arms are alongside the body with the palms facing forward and the fingertips spread wide. Relax the shoulders away from your ears and keep the chin parallel with the floor. Experience the sensation of simultaneously rooting down and rising up. Tailbone lengthening toward the earth as you reach through the crown of your head. Your body is a straight line of energy. Think shoulders over hips, hips over knees and knees over ankles. Hold for 10 deep breaths or longer, depending on your comfort. You’ll be surprised how challenging this pose is! 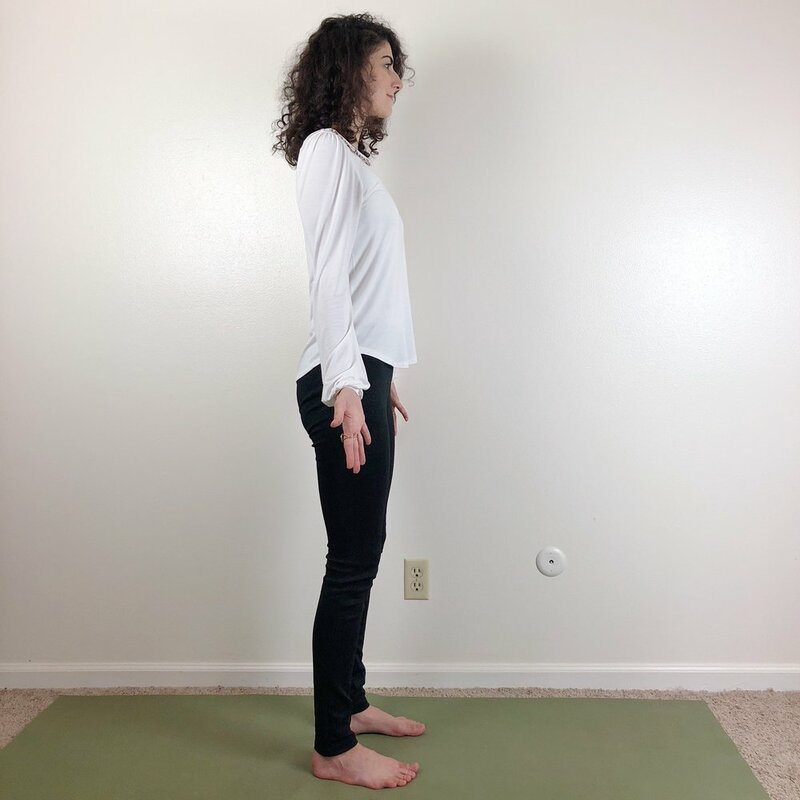 BONUS TIP: If you struggle with poor posture, practicing this pose with your back against a wall can help to train your muscle memory so that your body will learn what it feels like to be in proper alignment. This can also help if your muscles become fatigued easily in this pose. If you have foot or ankle pain or if you struggle with vertigo, the kneeling variation of this pose may feel better for you. Come into a kneeling position with the knees directly below your hips. The legs are at a right angle so that your ankles and feet are pointing straight back from the knee joint. Pull the lower belly and front ribs in. Relax the shoulders. Extend the arms alongside the body with the palms facing forward. Hold for 10 deep breaths. If you struggle with balance, holding onto the back of a chair is a good insurance policy. Try not to press any weight into your hands unless you have to. Focus on keeping your legs strong. Feeling the connection of your feet with the earth. Hold for 10 deep breaths. Be seated in a chair with your feet flat on the floor. The legs should be at a right angle so the feet are directly below your knees and the knees are in line with the hips. If your feet don’t reach the floor, you can place yoga blocks, a bolster or folded blanket under your feet. Actively press into the feet and sit bones. As you root down through the lower body, feel the spine lengthen. Pull the lower belly and front ribs in. Relax the shoulders. Keep the chin parallel with the floor. Hold for 10 deep breaths or longer, depending on your comfort. If being upright is not an option for you right now, I would recommend practicing savasana instead. This way you can still receive the benefits of bringing the body into a neutral position and practicing proper posture. Fish pose (matsyasana) is an intense backbend. Please approach this pose with caution if you experience blood pressure issues, migraines/headaches or neck pain/previous neck injury. Whenever I practice this pose, I pretty much always use props. You can still experience the same benefits without going into the traditional variation, so be gentle with yourself. It's a good idea to warm up with some cat/cow stretches and a gentle backbend like cobra pose. 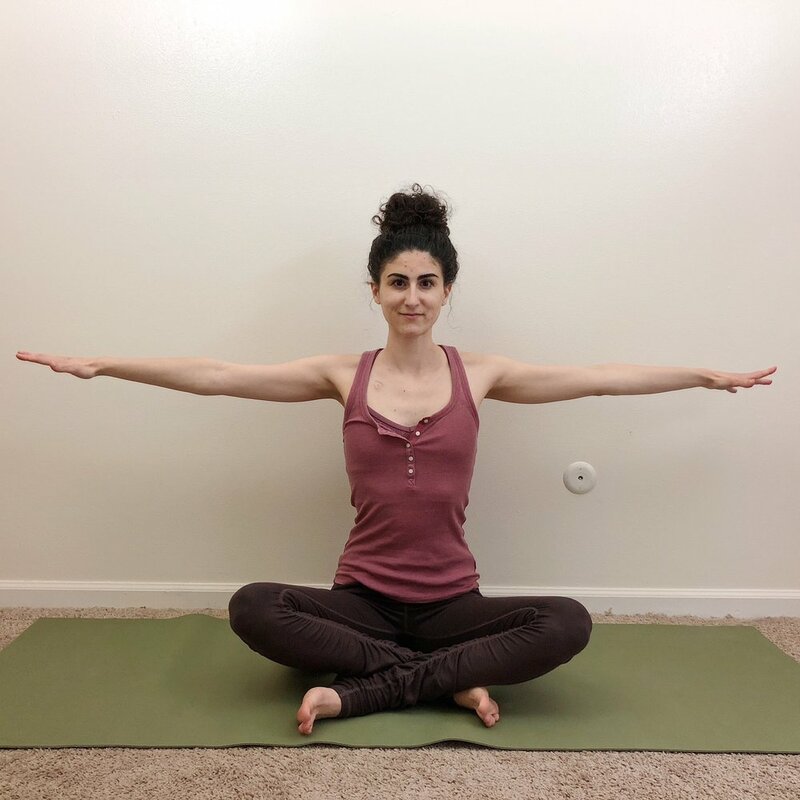 If you're going for an unsupported variation of this pose, I would recommend including it in the second half of your practice. Start by lying down on your back. Slide your hands underneath the outer edges of your hips with the palms facing down. Press into the elbows, forearms and hands and begin to lift your chest. Open your heart, broaden the collarbones while engaging the lower belly to protect your lower back. Keep the sit bones rooted into the floor. Lengthen the entire spine, including the neck. Keeping the neck long, lean back and rest the crown of the head on the floor. There should be no "crunching" of the cervical spine here. If this is uncomfortable, please consider trying option two instead. The neck is fragile, and it's not worth injuring yourself! The legs can be extended with the feet flexed, or you can bend the knees and place the feet flat on the floor. I'd recommend trying both leg positions and seeing which one feels best for you. It may be different for you each time, and that's okay! Hold this pose for 5-10 deep breaths, then return to lying on your back. Follow up poses should balance the spine, such as any type of forward fold or gentle twist. If you are uncomfortable placing the crown of the head on the floor, you can keep the head up. This does require a degree of strength to hold, so placing a block under the head is another option here. Hold for ten deep breaths. This is my personal favorite variation. You get to hold the shape of the pose without any effort. To come into this pose, you'll set the bolster so that it's horizontal. Lie back over the bolster so that it's underneath your shoulder blades. Take the arms overhead into "cactus arm" position. You can come onto the crown of the head if that's comfortable for you, but I prefer to support the head and neck with a yoga block. Hold for up to ten minutes, depending on your comfort. This variation can still provide a pretty intense chest opening. If your chest muscles are particularly tight, I would recommend the next variation. For this variation, you'll prop your yoga bolster up on top of a yoga block (or a rolled up towel or blanket) to create an incline. You can adjust the incline to lessen the stretch if desired. Turn your back to the bolster and lie back. Let the chest gently open and rest the forearms on the floor with the palms face-down. If your arms don't reach the floor, place pillows or yoga blocks underneath. The legs can be bent or straight, depending on your preference. Hold for up to ten minutes or even fifteen minutes, depending on your comfort. For the traditional variation of this pose, come down onto your hands and knees. The hips are stacked over your knees. You can point or flex the toes, whichever you prefer. The shoulders are stacked directly over the wrists. All ten fingers are fanned out so that you're pressing evenly into all ten fingertips. The fleshy part of the hand between the index finger and the thumb is pressing into the mat. The center of the hand is lifted off the mat like a suction cup. This activation of the hands is going to protect your wrists in this pose. Engage your core muscles to keep the back flat. The gaze is just past your fingertips, keeping your neck straight so that it is an extension of your spine. Hold this pose for five to ten breaths or longer if you'd like to challenge yourself. If you'd like, you can give yourself more space to explore in this pose. Take the hands beyond the shoulders, maybe take them as wide as the mat. You can do the same with your knees. This can make it feel a bit easier on the wrists, but it does challenge the shoulders a bit more. Give it a try and see if it feels good for you! If you have sensitive wrists, coming up onto your fists will take the bend out of your wrists, which can help to alleviate pain here. This can feel a bit odd for your knuckles though, so again, give it a try and just see if it feels right for your body. Adding blocks under the hands shifts the weight back onto the knees a bit, so this may be a good option for you if you are just beginning to build upper body strength or if you have sensitive wrists and/or shoulders. This option can be helpful if getting down to the floor isn’t an option for you or if you have sensitive knees or knee injury. The same idea of stacking the shoulders over wrists and hips over knees applies. You can rest the hands on top of the seat and fan the fingers or you can grip the edges of the seat like I have done here. Giving yourself extra padding on your knees can help to reduce pain. Remember that you can combine any of these variations to optimize your personal comfort.